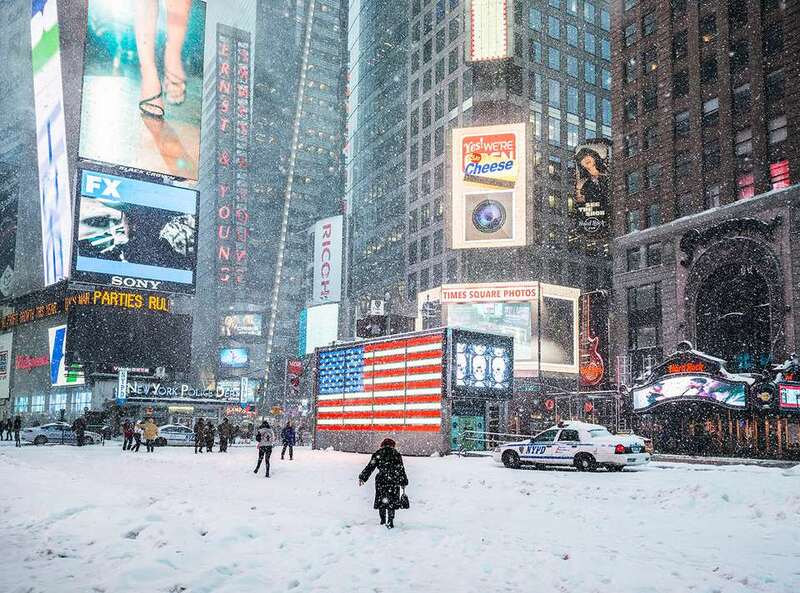 If you're visiting New York City during the winter, be prepared for cold weather or even snow. Although it isn't the coldest destination you could visit, you're likely to spend a lot more time outside than you might at home, so warm clothes and shoes are essential. Fortunately, there are many great things to do when it's snowy or cold in New York City during winter, with options where you can embrace the cold and snow or escape it, depending on your preference. Sure, ice skating is a cliche winter activity, but New York City's ice skating options are pretty spectacular. If you don't mind braving the crowds, you can skate at the Ice Rink at Rock Center, but if you want to experience New York City as a winter wonderland, you might prefer to try ice skating at Wollman Rink in Central Park. From the rink in Wollman Park, you can see skyscrapers surrounding the potentially snow-covered treetops of the park itself. There is also a free ice skating rink in Bryant Park and several other ice skating rinks around New York City. One great way to escape the cold and snow in New York City is to visit one of New York City's fantastic museums, many of which are free or "pay what you wish." It's easy to spend an entire day (or even several days) at the Metropolitan Museum of Art or the American Museum of Natural History, but many smaller New York City museums offer wonderful collections, as well as a perfect way to warm-up for a few hours. Smaller museums worth visiting include the Lower East Side Tenement Museum and the Frick Collection. Taking a boat tour might not be the first thing you think of when you are looking to escape from the cold or snow of New York City's winter, but it can actually be a great way to relax and stay warm while still seeing the city. All boat tours that operate during the winter have closed-in areas, but keep in mind that tour schedules are more limited during the winter months, so call or check the schedule online before you head to the dock. Winter in New York City is actually a great time of year for shopping. Post-Christmas sales offer great savings. While a cold day in New York City might not be the best one for popping in and out of Madison Avenue shops, it's easy to waste away the hours in one of New York City's great department stores or even the Shops at Columbus Circle. One of the biggest attractions in New York City are the shows on Broadway, and you can warm up this winter while watching a play or musical every day of the week. The cold weather means that lines at the TKTS Booth tend to be shorter, but if you're not into braving the cold to save some money, you can buy tickets directly at the box office. Sometimes, you may even find discounts if they offer standing room only or student rush tickets. New York City is a wonderful city for film-buffs and is home to a number of interesting movie theaters including the Film Forum and the giant AMC Times Square. In New York City, there is a far wider array of movie-watching options than you might find in your hometown, and there are also yearly film festivals around the city for true cinephiles. New York City socialites love brunch, and there are literally hundreds across the city that offer daytime service. Whether you're hankering for a light snack or you want to enjoy a full meal accompanied by Bloody Marys and Mimosas, there's no shortage of options in Manhattan, Brooklyn, and Queens. The best brunch spots in Manhattan include The B Bar and Grill in midtown, EJ's Luncheonette on the Upper West Side, and Elmo in the Village. One of the city's most famous venues for great standup comedy is the Comedy Cellar, which offers nightly shows year-round. If you want to spend the evening warming up by laughing your pants off, this is definitely the place to go. Be sure to check the full calendar for the lineup of upcoming shows—the Comedy Cellar is known to feature some of the biggest names in comedy throughout the year. New York City isn't just a city for entertainment, dining, and nightlife—you can also learn a thing or two from some of the best schools and institutes in the country while you're visiting. From craft beer lessons in Brooklyn to photography courses and cheese-crafting workshops in Manhattan, there are plenty of classes offered throughout the winter season. TimeOut New York maintains a list of ongoing classes that residents and tourists alike can enjoy to stay warm this winter. There's no better way to beat the winter cold than to cuddle up with your beloved pet while enjoying a warm beverage, and in New York City, you can do this even if you left your pet at home thanks to the Meow Parlour. Known as New York City's first cat cafe, this unique venue invites guests to enjoy coffees and teas while hanging out with dozens of feline friends. Although getting between venues, stores, and attractions will require you to go out into the cold, Times Square is packed full of places where you can spend hours indoors. From M&M World to the Museum of Wax, there are plenty of great attractions within the three-block by 10-block area that encompasses Times Square. You can even dine in some nationally-recognized chain restaurants, but keep in mind that prices will be inflated in this popular tourist area. Chelsea Piers is home to an entire complex full of activities that can keep the family warm and entertained all day long. Featuring youth classes and camps, a fitness club, adult and youth leagues, drop-in activities like rock climbing and bowling, and a variety of special events throughout the winter, you'll have no problem staying warm and active on cold and snowy days at Chelsea Piers. Although a majority of the subway lines in Manhattan are below-ground, you can get skyline views of the city if you take the F train out to Coney Island in Brooklyn and some great views of the city itself in Queens on the 7 and N lines. However, the subway can get quite confusing for tourists—and even some residents still struggle with directions—so be sure to check the map and ask for directions if you feel lost. A little known fact about New York City: a part of the island of Manhattan is considered international territory since its home to the United Nations. While you're visiting New York City, you can take a quick trip "abroad" on an hour-long tour the U.N. Headquarters. Available Mondays through Fridays from 9:30 a.m. to 4:30 p.m., the tours offer guests a behind-the-scenes look at the inner-workings of the U.N. including the Security Council Chamber, the General Assembly Hall, and the Economic and Social Council Chamber. Whether you're arriving in the city by train or you just want to visit one of its most famous landmarks, a trip to Grand Central Terminal is a must-see for first-time tourists and a great way to stay warm in the winter. While you're there, you can't miss the giant mural on the ceiling of the main hall, and on the underground level, there's a full food court with some of the best food in the city.